A VERY DRY WEEK BEFORE THE OVERFLOW OF RELEASES NEXT WEEK! THE FAKIR OF VENICE: Believe it or not, this was supposed to be the debut film of Farhan Akhtar. Meaning, it was shot in 2007 before Farhan Akhtar’s first film as an actor, Rock On, hit the theatres in 2008! The delay reportedly happened because the producers got changed. Then there were some Censor issues as well. However, such troubles have been faced by a lot of films and it’s shocking that the film had to wait for more than a decade to see the light of the day. The film also co-stars Annu Kapoor and is directed by Anand Surapur. It’s amusing to know that the film is based on the life of filmmaker Homi Adajania. The trailer is interesting as it tells the tale of a man who gets a fake fakir in Venice to con the European art world. The buzz however is negligible. When the film was to release in 2017, there were reports that Farhan will promote the film. Sadly, that won’t be happening and the only bit of promotion done by Farhan is to tweet the links of the film’s trailer and the song. Very few know that such a film is releasing and even if there was awareness, very few people in the urban multiplexes would have ventured out to see it. Ideally, The Fakir Of Venice should have directly released on an OTT platform. The opening will be less than Rs. 1 crore and if response, is positive, it’ll still have a tough time with such a bad opening. The other issue is also the fact that Farhan isn’t a big star who could pull audiences to theatres merely with his name. The film has just six days to score since Gully Boy releases next Thursday, which co-incidentally is a Farhan Akhtar production. 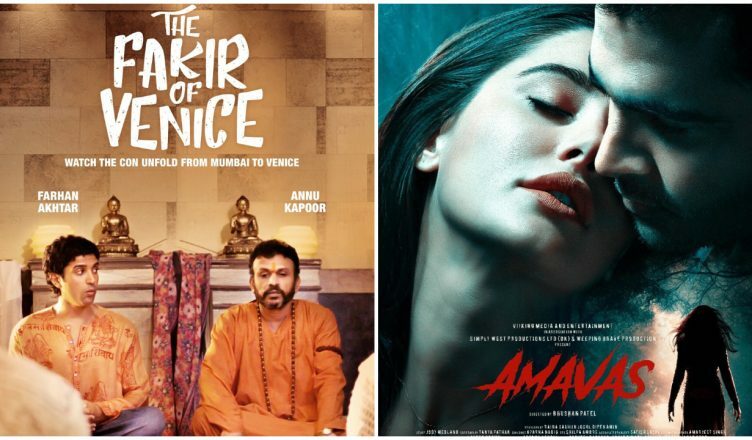 AMAVAS: This looks like a typical masala Hindi horror film, starring Sachiin Joshi and Nargis Fakhri. It is directed by Bhushan Patel, who has made similar horror films in the past like 1920 Evil Returns, Ragini MMS 2 and Alone. The trailer is okay and nothing new. But since it’s a horror film, it has a chance to score in the single screens and B and C centres. Last year, a similar film, 1921, released sans any significant promotion, and still had an opening of Rs. 1.57 crore. Amavas might open in the similar range or if audiences don’t turn up, the opening will be around Rs. 70-80 lakhs. It’ll definitely do better than The Fakir Of Venice.